My Sardinian Life has been nominated for the wonderful Versatile Blogger Award. A splendid way to start the new year, thank you Queens new life in Canada for the nomination. 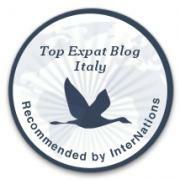 My Sardinian Life was nominated three times for this prestigious blogging award! So I am doing something right. You can read about the first two awards and the fantastic 30 blogs I’ve nominated below. Blogging Awards Bountiful and Laavventura is Versatile. 1. Post a link to the person who gave you the award thanking them for the award. 2. Tell your readers seven random things about yourself. 3. Award up to 15 newly discovered blogs. 4. Send them a note letting them know you nominated them. When I landed in Sardinia I didn’t speak a lick of Italian. Ciao doesn’t count. I can now understand my local dialect – Gallurese and can speak the odd word. I’m afraid of cows, sheep, horses and well … anything bigger than me while running my 6k. I could only boil water upon my arrival in Sardinia. Four years later and I’m a master in the kitchen. I never thought I would be happy being a house wife. Guess what? It’s the best! I started writing My Sardinian Life because I saw an old friend whose a blogger and a mom and a super-duper awesome seamstress/designer, and I knew I could do it too. I like to rock the boat, therefore I am not going to nominate 15 blogs for this award. I’m just going to admire it, on my virtual wall. And, well because I haven’t discovered 15 new blogs since the last Versatile award and I’m in Canada visiting little hands and hearts, they come first. Again a BIG thank you to Queens new life in Canada. If you haven’t checked out Queens new life in Canada I think it’s time you click the link to discover new their new-ish life in my home country. How do you rock the boat? You know how I rock the boat, Jennifer! Congrats on the award – again! Congrats! I’m kind of sad that Ciao doesn’t count since that is the only word I know. Now I’m back to only speaking one language again. Hope you are enjoying your holiday! Congratulations, Jennifer – well done! I jump in a boat and rock back and forth. How else would one rock a boat??? And YAY!!! You know what they say!!!! Third times the charm!!! !